There was a time when a “Sport” designation on a car merely meant that it had some extra bits of plastic bodywork, aluminum pedals, and if you were lucky, a retune of the suspension. 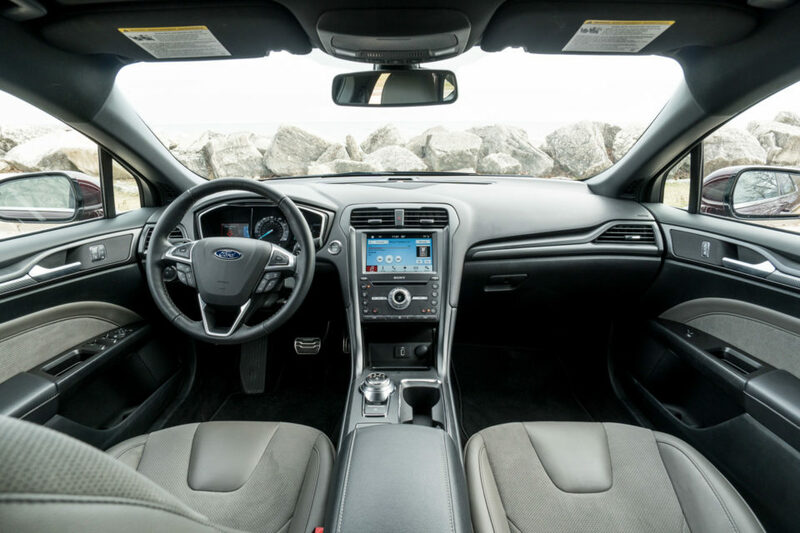 The Ford Fusion Sport is NOT one of those vehicles, packing a substantially more powerful engine, a dramatically upgraded suspension system, and more. Ever since its major redesign in 2013, I’ve thought the Ford Fusion was one of the best looking and most liveable mid-size sedans you can buy. So the Fusion Sport already has a solid foundation to build on. 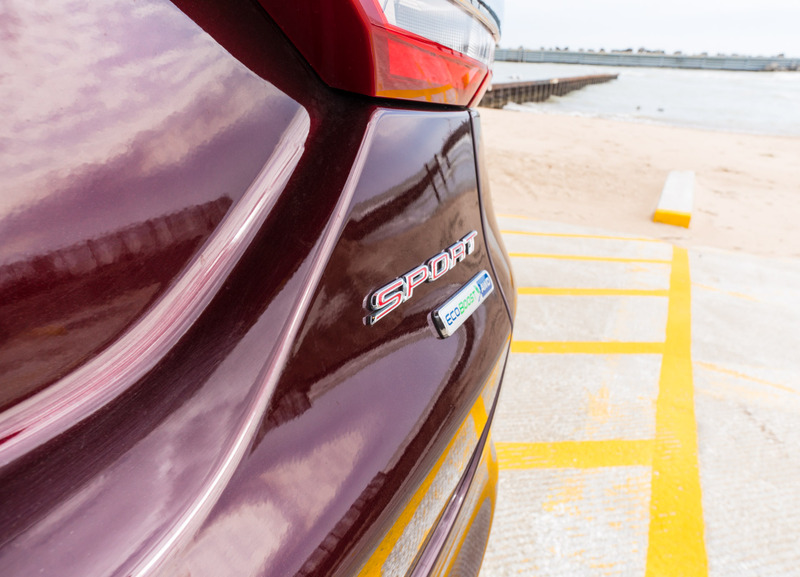 From the outside, there’s not a whole lot to distinguish the Fusion Sport from the Fusion. 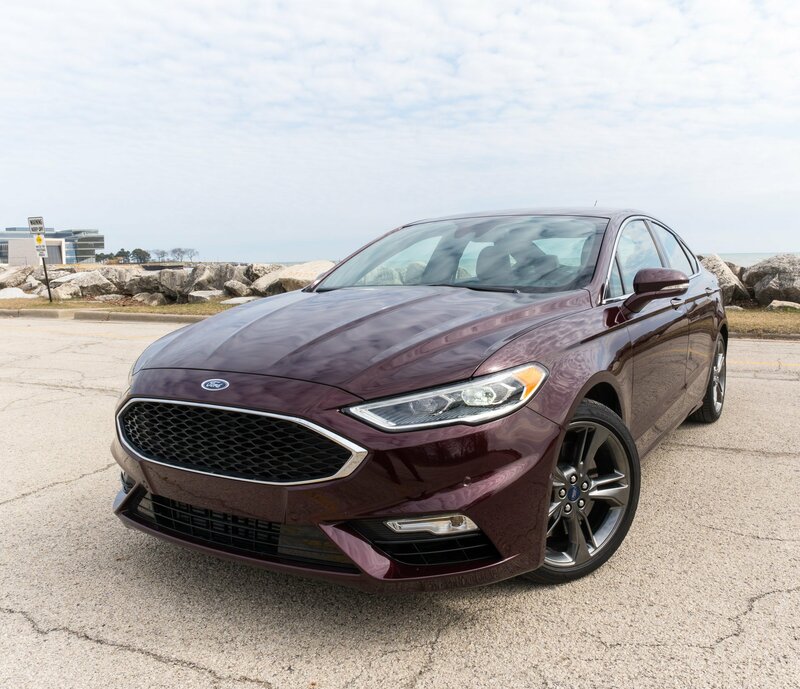 Other than its black mesh grille, 19″ dark finish wheels, and a small deck lid spoiler, you’d be hard pressed to tell it apart from a Fusion SE. I’m totally fine with that, since the Fusion’s design needs no improvement. If you didn’t know what you were looking for, the only way you’d know that something special was going on would be the SPORT badging on the rear. 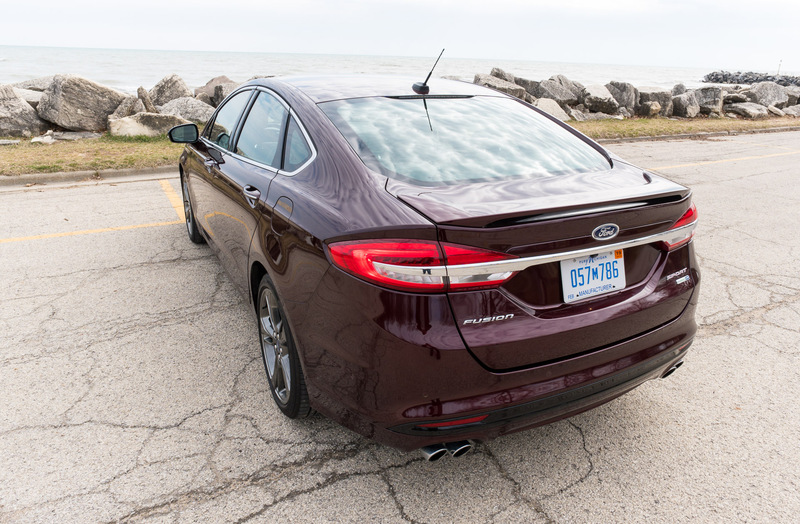 But cosmetics aside, where the magic really happens in the Fusion Sport is beneath its body. The Fusion Sport packs a 2.7-liter turbocharged EcoBoost V6 engine – the same excellent engine that can be had in the current F-150 pickup. 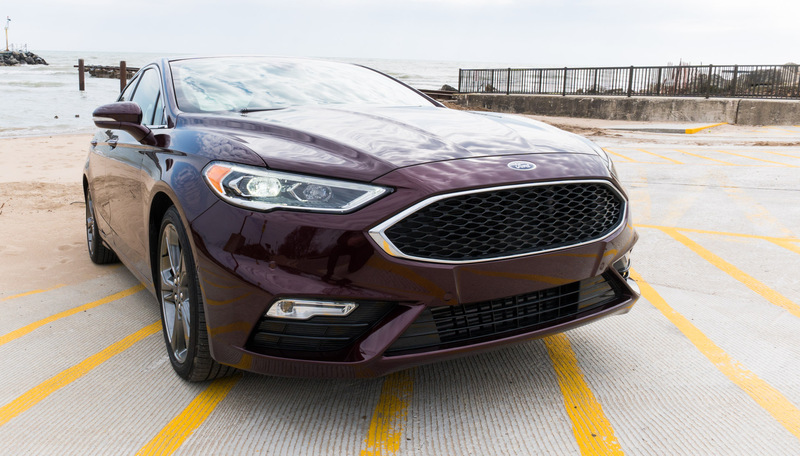 In the Fusion Sport, it makes an impressive 325 horsepower, and a whopping 380 lb-ft. of torque – a figure that puts it ahead of everything from the Audi A6 3.0T to the Porsche 911 Carrera S. To put things in perspective, even the more expensive Fusion Platinum has 80 less horsepower, and 105 fewer lb-ft. of torque. The engine is connected to a 6-speed automatic gearbox, and an all-wheel drivetrain. 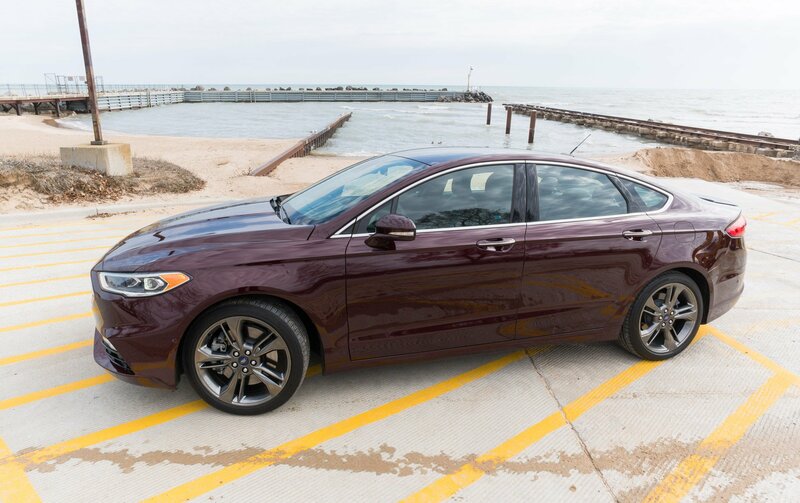 Put your foot down, and the Fusion Sport launches to 60mph in about 5.5 seconds, zipping you down highway entrance ramps, and zooming past the far less capable Camrys and Accords as you head into the passing lane. It’s not the sort of visceral acceleration you might get from a more traditional sportscar, but it’s satisfying, and there’s a bit of electronically-assisted roar as you get closer to the redline. Turbo lag is minimal, and the gearbox does its job well. It’s not as fast as a dual-clutch or some of the newer 8+ speed automatics, but it doesn’t have any quirks either. The standard sport disc brakes do a great job bring everything to a crisp stop, without fade. Ford throws in paddle shifters, but as if to admit that they’re not very useful, they made them tiny. Despite the owners manual saying they provide “full control of gear selection,” if you get too close to the redline, it automatically upshifts, and if you’re trying to downshift while the revs are high, it’ll block you too. I quickly gave up on the paddles, and just let the transmission do its own thing. The electric power steering itself is nicely weighted in Sport mode, and provides good road feedback. 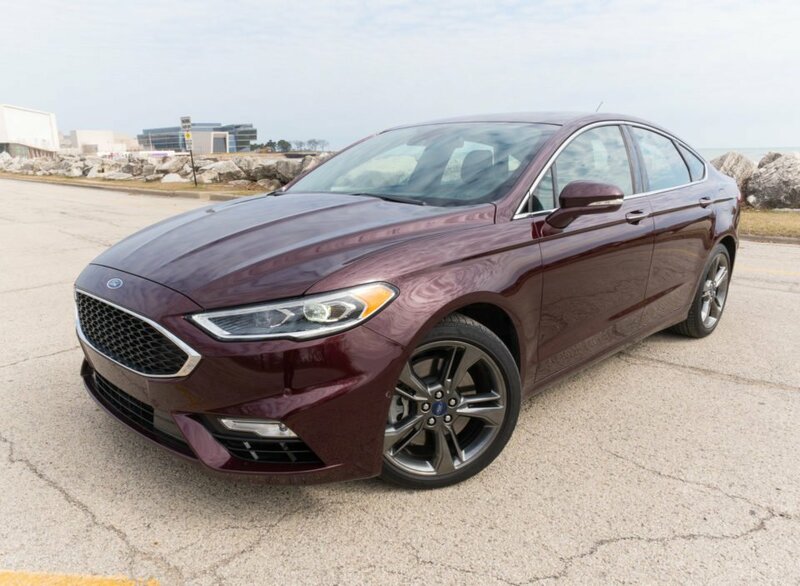 Since the Fusion Sport’s all-wheel drive system is front-wheel biased, the car spends most of its time as a front-wheel drive, sending up to 50% of its power only if it detects a need for traction, such as during hard acceleration, cornering, or driving on slippery surfaces. This setup is definitely good for driving in wintry and wet conditions, but favoring the front wheels means the Fusion Sport has a tendency to understeer, and doesn’t offer the kind of sharp cornering I’m used to in rear-wheel drive or rear-wheel biased AWD sports sedans. It’s also a rather heavy car, weighing in at just under 4,000 lbs. The upgraded suspension system is quite good. Continuously-controlled dampers dynamically adjust based on driving conditions, and stiffen significantly in Sport mode. Ford engineers also made it so the dampers can absorb the impact of nasty potholes, by detecting an impending drop, then stiffening up just before the wheel has a chance to bottom out. 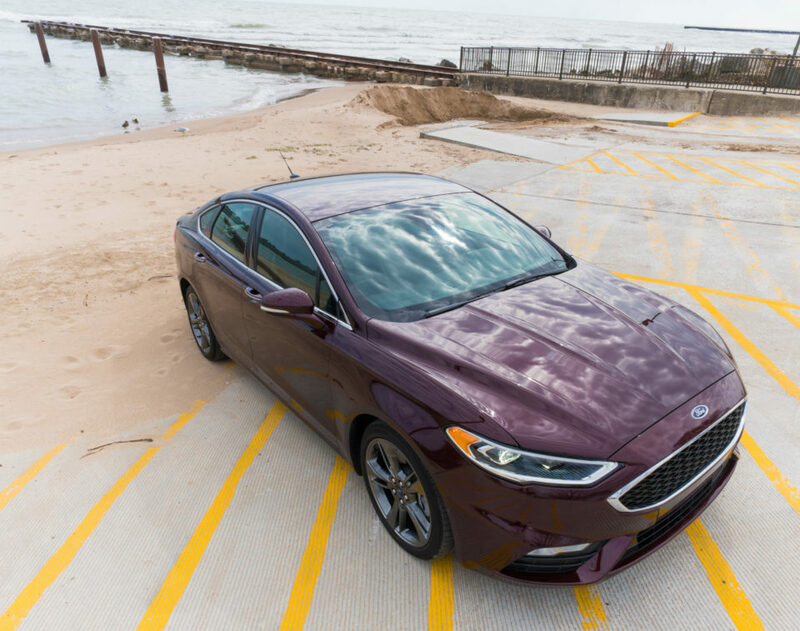 Riding on the pothole-riddled streets of Chicago was far more pleasant than normal in the Fusion Sport. 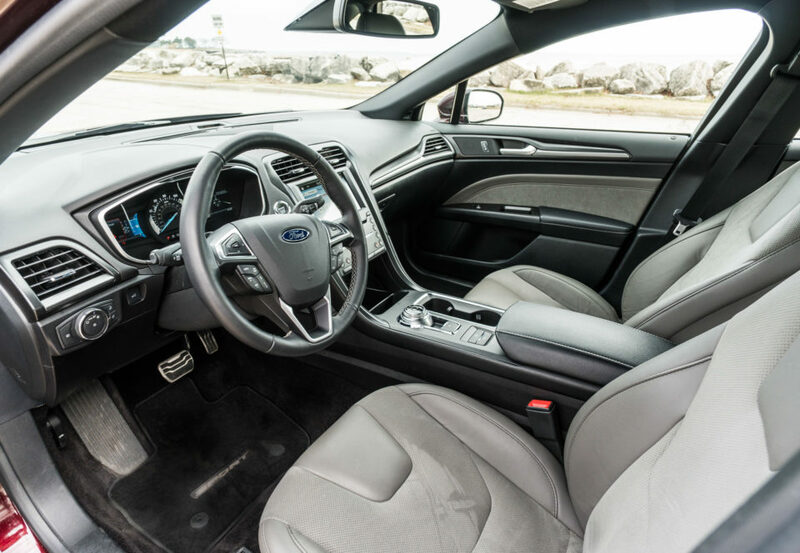 Inside, the Fusion Sport is handsomely designed, with a clean and modern appearance, well-placed controls, and a good balance of touch and tactile controls. 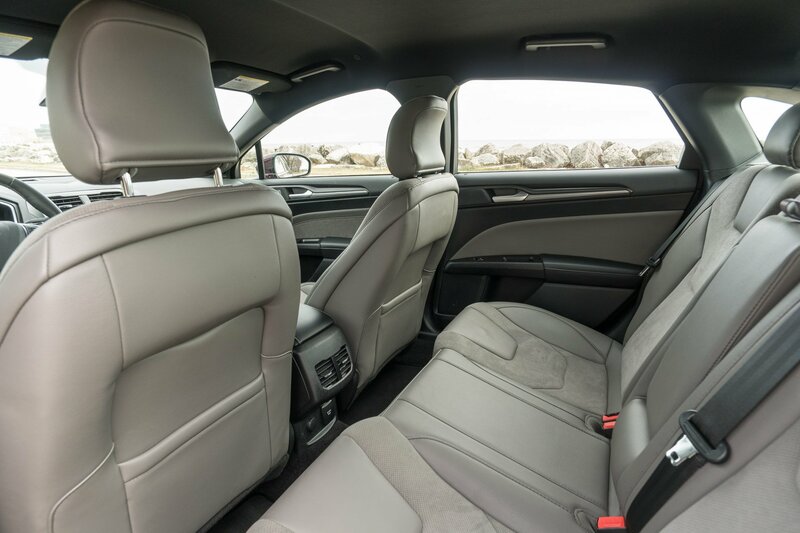 The seats and doors feature leather trim with sueded inserts, and soft-touch surfaces are plentiful. The lack of shiny surfaces means minimal glare, fingerprints, and dust in the cockpit. There’s a little bit of faux carbon fiber trim on the dash and doors that looks nice as well. It’s nice and quiet inside too, even at highway speeds, with the only sound present being the engine, which is most audible in sport mode. 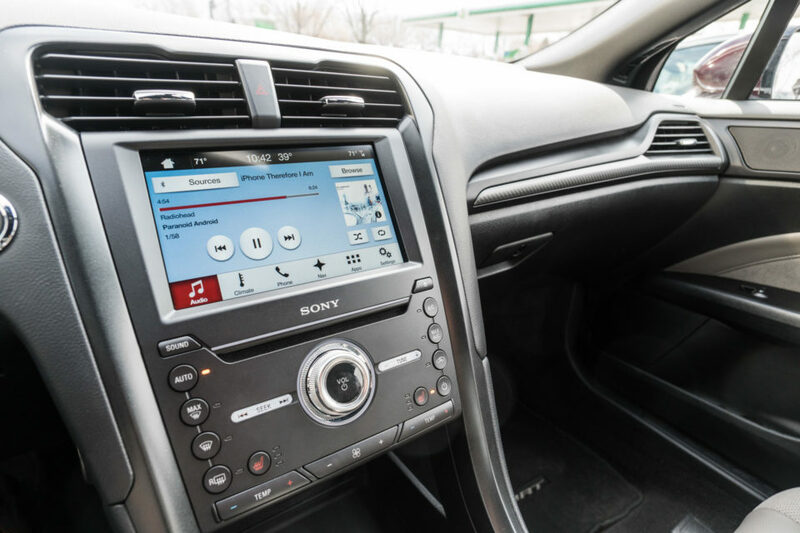 An 8′” touchscreen with Ford SYNC 3 comes as part of the optional $2,000 401A equipment group. 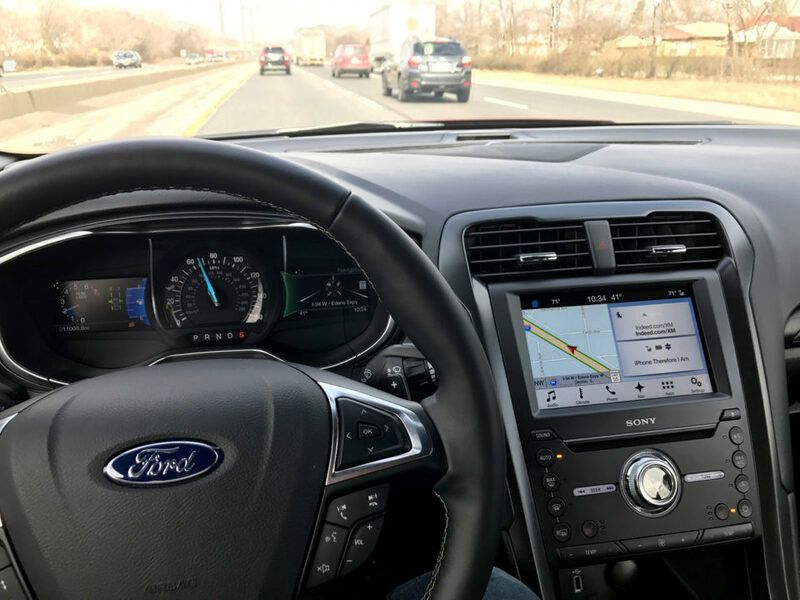 SYNC 3 works brilliantly, and is fast, easy to use, well organized, and includes both Apple CarPlay and Android Auto integration. This package also includes a pair of 4.2″ LCD driver information displays, ambient lighting, dual-zone climate control, reverse sensing, a 10-way adjustable passenger seat, and a very good sounding 12-speaker Sony audio system. Voice-guided navigation is a rather costly $795 add-on on top of this, and I really think it should be included. Other available tech features include lane-keep assist – which gives a subtle vibration if you drift out of your lane, blind-spot monitoring with cross-traffic alert, and adaptive cruise with the ability to come to a complete stop and resume. This worked quite well for me on a long highway drive through stop/start rush hour traffic. There’s also an available parking assist system which can automate the steering tasks when parallel or perpendicular parking. I think that system’s most useful feature is its ability to automatically steer for you when squeezing out of a tight parallel space. Front sport bucket seats offer heat, and can be upgraded to include cooling as well. 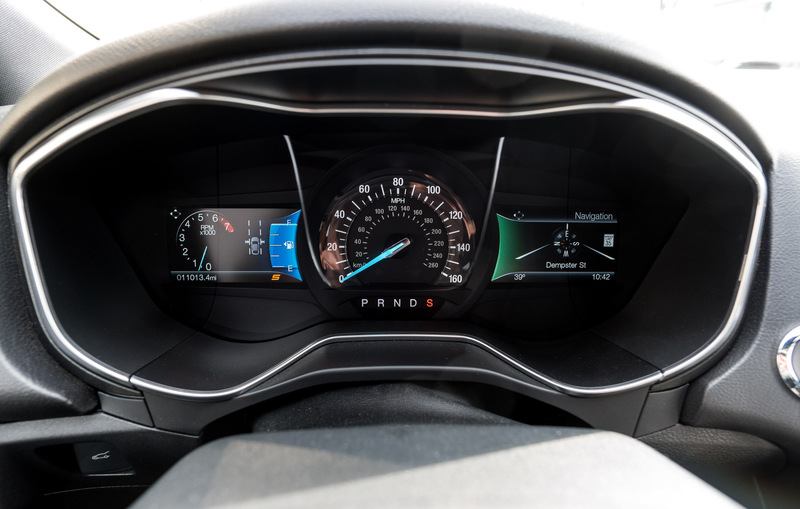 A heated steering wheel is standard as well, though I wish there was a physical button to activate it – it’s only adjustable from the touchscreen. I found the seats offered good support and comfort on long drives, and the padding and bolstering was well placed. The rear seats offer ample legroom and headroom, and can be folded in a 60/40 configuration to expand cargo capacity above the trunk’s standard 16 cubic feet. Rather than a sports sedan first and foremost, the 2017 Fusion Sport is a family sedan that just happens to be fast and handles well. If you’re used to living with an everyday sedan, and just want a faster and more agile car, the Fusion Sport is an excellent choice, and offers great bang for the buck.